Kara Mia and Desi-Eh. Two separate restaurants with two separate identities, coexisting simultaneously under one roof. Kara Mia, the original personality in this multiple personality persona, was born in 2006 as one of the first halal Italian restaurants in Toronto, and one of the first halal restaurants that wasn’t an every day South-Asian curry house. Naturally, after many years of being successful as a result of being different, the owners decided to try their hand at being even more successful by err – not being so different, and so, created Desi-Eh, a Pakistani alter-ego serving Punjabi cuisine alongside their Mississauga branch of Kara Mia. “Kara Mia”, literally translates from Italian to English as “My Darling”, and funnily enough, in most “desi” or south Asian languages, this same, loving term of endearment is quite often expressed as “EH!”, (particularly when one partner needs something from the other partner). It’s clear then, that romance was the basis of nomenclature for both parts of this conjoined restaurant. All the meat here is halal. Kara Mia’s Mississauga branch was one of the few restaurants in Toronto which I visited on two occasions. When carrying out my pre-holiday reconnaissance, I had no idea of Kara Mia’s marriage with its Punjabi partner, and so, when we arrived, I was rather bemused by the two separate doors which seemed to lead into the same building. Like every married couple, Kara Mia and Desi-Eh seem to take the “what’s mine is yours” principle a little too literally. It’s only a wonder as to which of the two takes up more space in the kitchen, and which is left with a tiny, cold corner with a microwave. With doubt as to whether it was an optical illusion or our own ineptitude, we strolled in dazed, confused and questioning our ability to open doors, though of course, all was revealed within. On our first visit, we opted for a large helping of Kara Mia’s saffron poutine to share. It was made up of soft fries, consisting of thick potato in a firm skin, embedded within layers of cheese and saffron sauce, which provided strong, rich and creamy flavours that meshed together incredibly well. It was in fact, the first poutine I had ever tried, and whilst it was not a conventional poutine, it was certainly a fantastic one for this very reason. 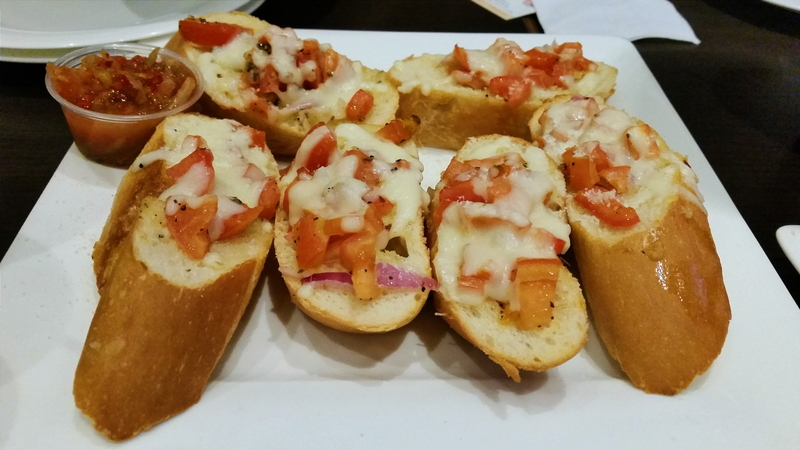 The manager/head chef also gave us some complementary garlic bread as a “Welcome to Canada” gift. The bread was of a good quality, possessed a strong cheesy flavour, and delivered a contrasting set of textures from the soft tomato, crunchy bread and crispy crust, as well as a very sharp, spicy zest from the accompanying sauce. As far as welcoming gifts go, it was far better than any Canadians could expect to receive from a British restaurant. At best, they’d probably receive a slightly smaller frown as they dined. 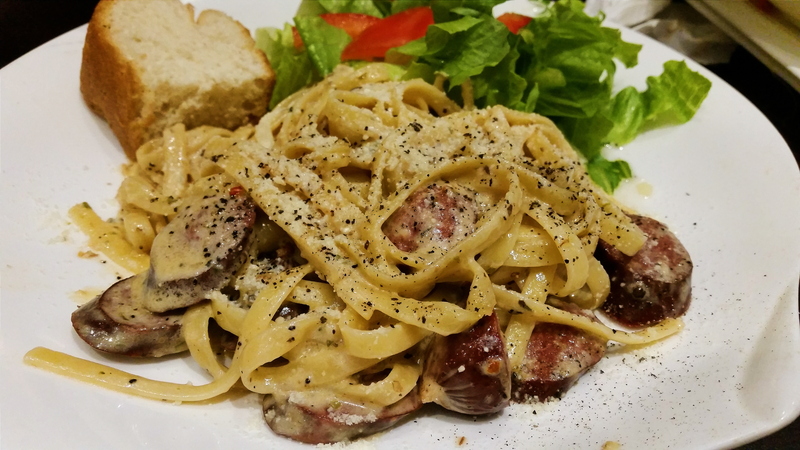 For mains, I opted for the fettucine alfredo with Italian sausage. The fettucine pasta was dense, thick, and seemed to be served slightly al dente, resulting in an ever so slightly firm texture, and was covered in a flavoursome alfredo sauce. The sauce, (consisting of garlic and parmesan), created a slightly “clean”, greasy texture that complemented the pasta well. The Italian sausage was thick and of a good quality, although the skin in which it was encased was slightly rubbery and elastic in nature. Nonetheless, it possessed a pleasant, mildly spicy essence which complemented the pasta well. The dish was also served with fresh salad and a slice of bread, which was unfortunately rather tough and unforgiving, but I’ll assume that they were simply giving us a tasteful reminder of life in London to make us feel at home. 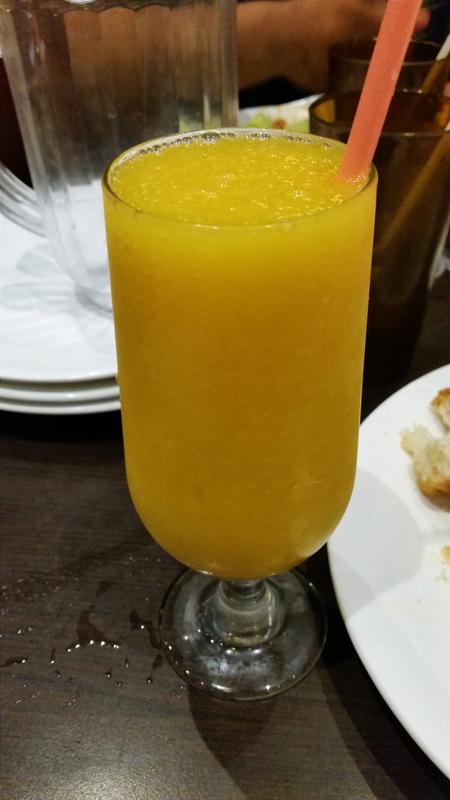 I also ordered a mango bellini mocktail to accompany my food, which seemed to be a simple blend of ice and mango nectar rather than an actual mocktail. Nonetheless, it possessed a strong, sharp sweetness, and was quite refreshing, even if it’s mocktail status and price tag was questionable at best. Meanwhile, Timon, my meerkat doppelganger, along with Yogi bear, Boo-Boo and Ranger Smith, opted for the Desi-Eh menu, and ordered a “Desi-Eh Kebab Experience”, which consisted of an assortment of lamb, chicken and sheesh kebabs, along with naan and chickpeas, and naturally, I pinched a bit of everything when I could. The lamb was soft, full of flavour and very tender, delivering a strong hint of achar/pickle with every bite, whilst the chicken, also soft and tender, possessed a thick and moist texture that was well seasoned and full of a mild spicy flavour. Perhaps the most impressive sight was that of the sheesh kebabs, which, in comparison to those usually served in UK restaurants, were incredibly thick and large – so much so that I could easily have picked one up and knocked everybody out with a single swing should they have not been willing to let me sample one. Fortunately, they were, and there was no need to give anybody a concussion. 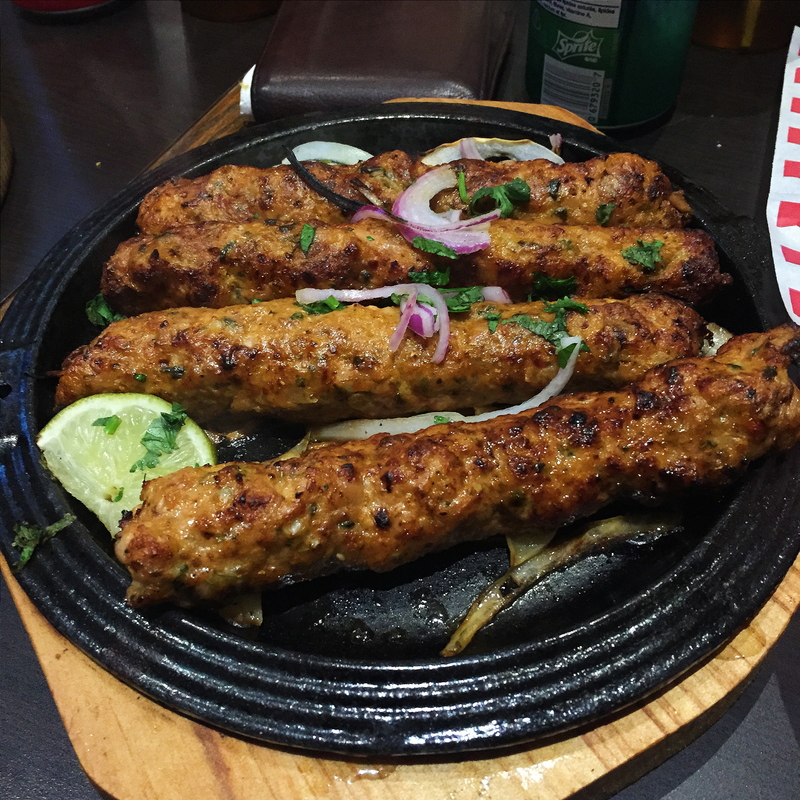 The sheesh kebabs were soft and succulent, and possessed a moderate amount of flavour. We enjoyed our respective meals so much that we decided to pay Kara Mia/Desi-Eh another visit later in the week, for a quick, last-minute takeaway. Following the manager’s recommendation, we ordered the boneless chicken karahi (not pictured), which consisted of extremely soft and moist pieces of chicken in a thick and creamy curry gravy, which was full of smooth flavours. With regards to the Kara Mia menu, starters range from $5-$10 (£2.50-£5), mains from $12-$25 (£6-£12.50), and drinks from $4-$6 (£2-£3), and my meal amounted to around $25 (£12.50) after tax, (which is around the amount you can expect to spend at most restaurants in Toronto). On the Desi-Eh menu, prices range from $10 (£5) for single dishes to around $50 (£25) for large platters and sharing portions of various curries. Generally speaking, the quality of the food is good to high, and whilst the same can’t be said for the mocktails, the food is well worth your buck. 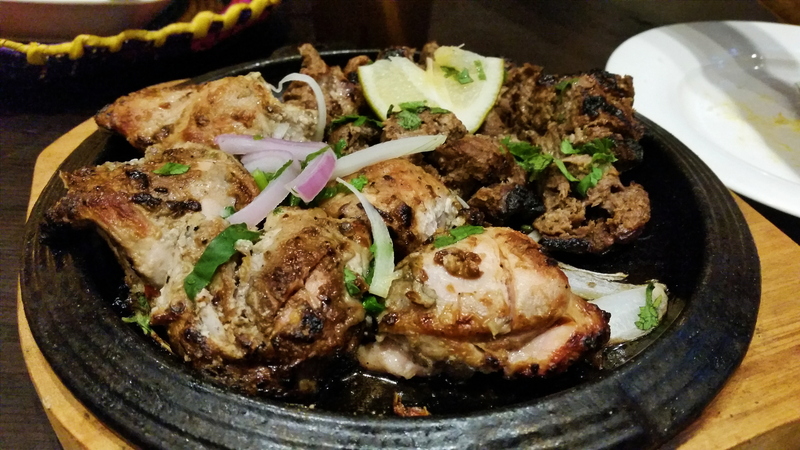 For a low-key restaurant, Kara Mia/Desi-Eh delivers well in quality, flavour and satisfaction, and certainly produce some excellent food at a low-key price. Of all the restaurants I had the chance to visit on my first trip to Toronto, (and my first trip to the other side of the Atlantic at that), Kara Mia/Desi-Eh provided the warmest welcome, and frankly, they deserve a much higher score for their service than a 5/5. The staff were an absolute credit to the classical Canadian stereotype, and completely personified the “overly-friendly Canadian” in culinary form. The kind of Canadian who would get hit by a car and then apologise profusely for getting in the way, or be rushed to hospital after visiting a blood bank, simply because they donated too much. On both visits, the staff and the manager/main chef repeatedly engaged in conversation with us, and engaged with us in a personal way that was outside of the staff and customer context, and more in the simple context of a group of unacquainted humans sharing a conversation. And if the free starter on our first visit wasn’t enough, on our second visit, the chef left midway through our wait to make us a quick Desi-Eh starter composed of chickpeas, rice and raita, simply for us to warm up our appetites with as we waited for our takeaway. In London, such small gestures and friendliness is, for the most part, simply unheard of. The staff here certainly spend the time and the effort to connect with their customers, and it simply gives the restaurant a very welcoming, very human appeal, and personifies the establishment as so much more than a simple business or restaurant. Whilst the service may enhance the dining experience at Kara Mia, the decor, unfortunately hinders it. Whilst their Markham branch has a more fitting restaurant decor, their Mississauga branch seems to be a little worn for wear, with outdated tiling, tired furniture and an overall lacklustre appearance. It is however, worth mentioning (as I already have), that most restaurants in Toronto go for a much more function over form decor compared to those in London. That said, I still can’t help but feel as though the restaurant falls very short of the presentation it needs to equal the charm of its staff and its food. Kara Mia/Desi-Eh is otherwise a fairly small to medium-sized restaurant, with plenty of parking available in the large car park outside. Despite the decor leaving little to be desired, the extremely pleasant staff help to create a wonderfully welcoming environment, where it’s easy to feel at home and at ease. The atmosphere is jovial and warm, and conversations can run in full swing both amongst your dining companions, and with the staff. It’s certainly a low-key, family restaurant with an air of simple charm to its simple surroundings. Of all the restaurants which attempt to perform a double act with two different cuisines, some tend to shoot themselves in the foot and deliver one cuisine with an overwhelming dash of mediocrity and disappointment. Others, manage to shoot both feet, tie an anchor around one leg and an anvil around the other, and sink both cuisines to the bottom of the ocean floor like a culinary episode of Looney Tunes. Whilst every restaurant that serves any particular cuisine can be likened to a slightly leaky ship, those that attempt to dabble with more than one (excluding fusion restaurants), are often the leakiest, owing to a lack of focus and specialised expertise. My discovery of Kara Mia’s co-habitation with Desi-Eh initially raised a small sense of concern as to whether the Italian food I was seeking would be authentic – or at the very least – be any good. A sense of concern that was quickly relinquished as soon as the food was served. Italian cuisine and Pakistani cuisine have as many common points of contact as Britain’s border with France, and the fact that this small restaurant can do justice to both is nothing short of praiseworthy. With such a lovely group of human beings on deck to cater to your needs, and a wonderful variety of dishes to satisfy your Italian or South-Asian cravings, Kara Mia/Desi-Eh is a restaurant worth visiting if you want a truly Canadian welcome to Canada.